The presidential election in Slovakia, which reaches its decisive second round on 4 April 2009, finds people still asking themselves a question that has persisted since independence in January 1993: "what kind of country are we?" "Podiet' sa" (23 September 2004) - part of our "untranslatable words" seriesof that state agreed on an amicable "velvet divorce"; and more than ten since the end of the semi-authoritarian rule of its first post-independence prime minister, Vladimír Mečiar - but Slovaks find it hard to escape from endemic uncertainty about whether or not they are living in a "standard" or "normal" country. It is not altogether a new question - Slovak national identity has long been full of complexes, as reflected in many books on the topic. What makes it more pointed today is that outwardly Slovakia has many of the ingredients of a modern European country: it is a member-state of the European Union (since January 2004), part of the Eurozone (since January 2009), and has a reasonably well-performing economy that though hit by the global recession is not under the same pressure as Latvia or its neighbours Hungary and Ukraine. But there is another aspect of its modernity, which gives a new twist to an older story. This is the legacy of the immediate post-independence period of 1993-98, when successive governments led by the populist and intolerant Vladimír Mečiar led the country into international isolation, economic stagnation, and political constriction. 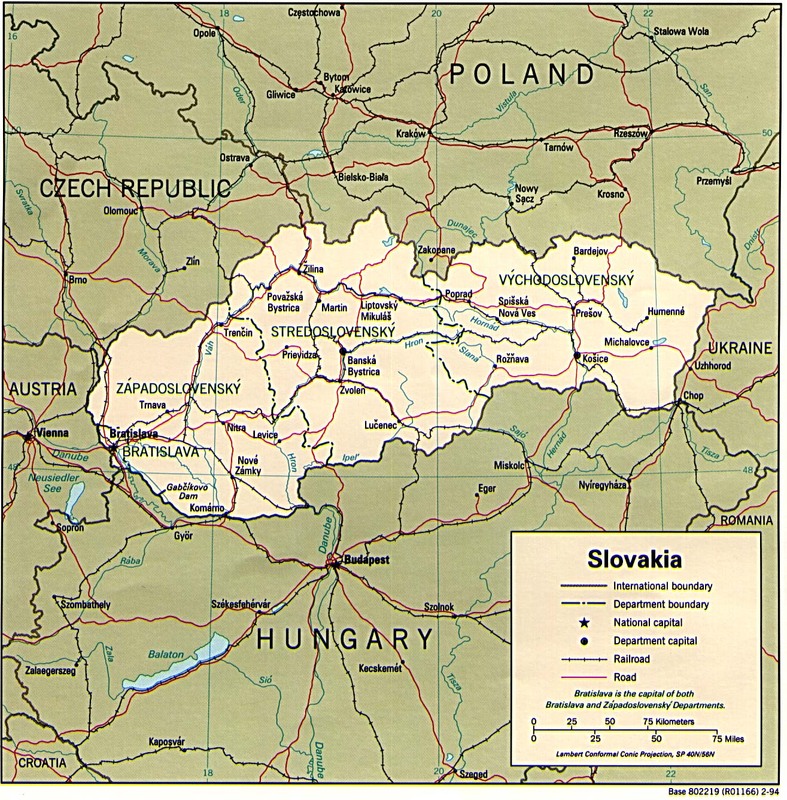 The accession to the European Union allayed but did not quite bury the question of whether Slovakia had become a "standard" country. It survived the retreat of Vladimir Meciar from the political scene, but made a comeback with the electoral victory in 2006 of a younger, slicker, media-savvy populist: Robert Fico. His Smer-Sociálna Demokracia (Direction-Social Democracy) party defined itself as leftwing, though in its railing against elites, intellectuals and outsiders it had many of the characteristics of a party of the right. In any event, the return of "non-standard" political behaviour was symbolised by Fico's formation of a coalition government with the extreme-nationalist Slovak National Party (SNS) and Mečiar's own Movement for a Democratic Slovakia (HZDS). Three years further on, the campaign for the presidency - albeit a largely ceremonial position in Slovakia's parliament-centred political system - feels inhibited by this post-independence past. The first round of the process was held on 21 March, and saw the two strongest candidates - the incumbent Ivan Gašparovič (who received 46.7% of votes cast) and his main rival Iveta Radičová (a sociology professor and opposition MP, who received 38.1%) progress into the run-off vote on 4 April. Iveta Radičová's challenge is historic in two senses. This is the first time that a woman has had a realistic chance of holding one of the country's top political offices in the country (indeed in either of Czechoslovakia's successor states), and moreover of being elected by a direct popular vote. Moreover, it is the first time that a candidate untainted by a communist past has come near to the summit of power in Slovakia. Each of three post-1993 presidents - Michal Kovac, Rudolf Schuster, and now Ivan Gašparovič - had been communist party members before November 1989. Krzysztof Bobinski, "Poland: the politics of history" (24 January 2009) the most serious trespasses committed under Mečiar's watch; though he later fell out with his boss. The feud has lasted: Mečiar's HZDS made a point of fielding its own candidate in the election, who however received a meagre 2.5% of the vote. This outcome testifies to the way that the rise of the new populist darling Robert Fico has eclipsed Mečiar's appeal. In any case, Gašparovič can rely on the support of Fico's Smer-SD and the SNS. All the complexes of post-independence Slovakia, assiduously stoked and stroked by Vladimír Mečiar and Robert Fico, seem to be concentrated more and more on the issue of relations with the country's Hungarian-speaking minority in the south of the country. The national sensitivities of a historic relationship in which (to put it in slightly caricatural terms) imperial Hungary and peasant Slovakia were long entangled are ever present, and the use of the "Hungarian card" is nothing new in Slovak politics. But a series of controversies in recent years - such as a prolonged dispute over the use of geographical names in new textbooks for Hungarian-speaking schools issued by the SNS-controlled education ministry - has allowed these tensions to be exploited for political gain. The potential for the issue to become toxic was seen in responses to the first-round results, whose voting patterns revealed that the only areas won outright by Iveta Radičová were the Hungarian-speaking regions and Slovakia's two major cities - the capital, Bratislava, and Košice. The xenophobic Slovak Nationalist Party responded to the news by issuing appeals to the "Slovak nation" to mobilise and avert the danger that "Hungarians" (read: Hungarian-speaking citizens of Slovakia) will "dictate" who will be the president of Slovakia. The SNS are extremists, yet part of the government of the country. What is more worrying is that the president and prime minister - Ivan Gašparovič and Robert Fico - have allowed these hard-right nationalists to influence the tone of the former's re-election campaign. The election adverts with slogans such as "Slovaks, let's vote Ivan Gašparovič!" or simply "Slovaks, vote!" are one indication of this discourse. Fico, for his part, called a special meeting of the state's security council a few days after the first-round results to discuss the alleged activities of a Hungarian extremist group on Slovak territory. The "non-standard" political behaviour continued when pro-Radičová election posters appeared in several Hungarian-speaking towns in southern Slovakia, pledging support if she were elected for the political autonomy of the region and the "fulfilment of (Hungarian-speakers') age-old desires" (which were left unspecified). The posters, shoddily produced and written in a shaky Hungarian, were obviously fake, but they worked their way into the campaign in a way probably planned by their creators. A few hours after the posters appeared, the SNS - using a media agency working for Ivan Gašparovič - placed adverts in a west-Slovak regional periodical warning voters that Radičová had promised autonomy to "the Hungarians" and calling the "Slovak nation" to prevent this. Gašparovič denied knowing anything about these adverts. But the non-issue issue had arrived - even though Hungarian-speaking voters have no interest in autonomy, the president has no responsibility over such matters, and "the dream of autonomy" exists only as a scare-story to foment nationalist suspicion among voters in Slovak-speaking voters in the country's west and centre. The real political effects of a phantom controversy are reflected in the fact that Slovakia's decision not to recognise Kosovo's independence is largely owed to fears over the domestic repercussions of such a decision. The region's association in Slovak politics has a further twist, in that Miroslav Lajčák - who left his post as the high representative of the United Nations and European Union in Bosnia-Herzegovina to join Robert Fico's government as foreign minister - has found himself sitting in a cabinet alongside extreme nationalists set on worsening inter-communal relations. Lajčák issued a statement opposing the division of voters along ethnic lines, only to be rebuked by SNS leaders for his "irresponsible and unprofessional" intervention in the election campaign. The relative lack of political power invested in Slovakia's presidency means that the current concerns of voters - the economy and unemployment above all - have paradoxically featured little in the campaign. Perhaps that explains why only 43.6% of the electorate voted in the first round. It remains to be seen whether Ivan Gašparovič or Iveta Radičová will benefit more from the divisive tactics of an unpleasant race. Radičová's chances on 4 April depend on her ability to reach out to those who stayed away from the polls on 21 March. If she comes through, it may be at last the beginning of an answer to the question that refuses to go away.